What do you believe? Why is this important? According to Pastor Joel Osteen, it's because we will become what we believe. Our beliefs will prove either a barrier or vehicle as we strive to go higher, rise above our obstacles, and to live in health, abundance, and victory. Osteen says, "I am what I am today because of what I believed about myself yesterday. And I will be tomorrow what I'm believing about myself right now. God sees us as more than conquerors, able to fulfill our destiny. We need to see ourselves through the eyes of our Creator." Your Best Life Now has sold over 150,000 audio copies to date. Joel Osteen's Lakewood Church, serving over 30,000 members, has Spanish services and programming to meet the ministry needs of members. - Publisher In this remarkable book, Joel Osteen offers you unique insights and encouragement that will help you overcome every obstacle you may encounter. Your life has a divine purpose and destiny. As you put the principles found in these pages to work today you will begin living YOUR BEST LIFE NOW! 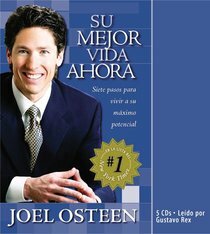 About "Su Mejor Vida Ahora (Your Best Life Now)"
In this remarkable book, Joel Osteen offers you unique insights and encouragement that will help you overcome every obstacle you may encounter. Your life has a divine purpose and destiny. As you put the principles found in these pages to work today you will begin living YOUR BEST LIFE NOW!